PCL recognizes the economic and environmental value of smart buildings, but smart construction is equally important. By enabling real-time data capture and analytics regarding the condition of a job site, the PCL SMART Construction Technology Challenge aims to create environmental stewardship, job-site safety, operational efficiencies, productivity, and improved profitability at the face of the job site. This challenge is focused on reduction of job site energy use, reductions in waste, and reduction of greenhouse gas (GHG) emissions, thereby decreasing the carbon footprint. According to a March 2017 study, the Canadian construction industry produced over 6,000 Mega Tonnes of CO2 in 2015, with Alberta contributing over 1,000 Mega Tonnes. These reductions will be enabled using custom industrial grade IoT sensors and data gateways for environmental sensing. The sensors will stream telemetry from a construction site and will include low power technologies, security, transport protocol, flood relays, radio technologies and the ability to integrate with PCL’s MS Azure cloud computing platform. The sensor node needs to wake periodically to receive downlink (cloud to sensor) messages and provide the latest sensor readings in uplink (sensor to cloud). The sensor node shall also wake asynchronously on a threshold-based acceleration event outside of its normal reporting period. Sensor requires a minimum battery life of five years, with a target of 10 years. The sensor form factor ideally measures 60 x 60 x 25 mm or less and its enclosure must be appropriate for simple (and easy) adhesive or single screw mounting. The form factor’s material must be able to survive UV, water spray (IPx5), humidity, temperature, dust (IP6x) and VOC exposure and be rugged and durable to survive harsh construction job site conditions, particularly cold Canadian climate conditions. The sensor and gateway technology shall meet jurisdictional, provincial and federal safety codes, such as Underwriter Laboratory certifications, pertaining to such electrical and radio-frequency equipment. 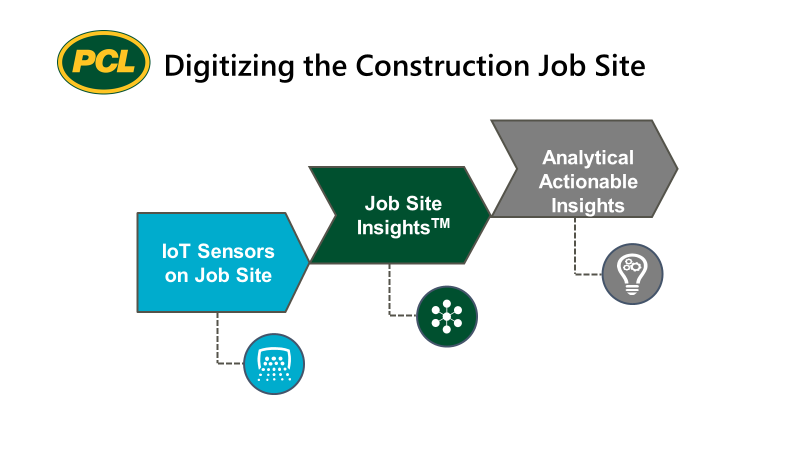 PCL’s challenge includes the use of advanced analytics and machine learning models to measure, forecast, predict and optimize/control job site factors that positively influence lean construction practices (e.g. reduce or eliminate re-work), cost savings, efficiencies, worker safety and energy consumption/CO2 emissions. In addition to sensor data, PCL’s analytics challenge could also include data from project schedules, cost estimates, design documents, progressing data, BIM models and external sources including weather forecasts. Reduce job site energy use, reduce waste, reduce carbon emissions, thereby decreasing the carbon footprint. Lead to the development of a platform that measures, forecasts, and optimizes energy use from construction activities. This outcome would be a revolutionary advancement, since the construction industry rely on systems with limited tracking and monitoring capabilities. Make material progress on understanding root causes, predictive factors, and data collection gaps of energy use and rework that beneficially informs the construction industry and building owners on core insights and required data collection and process improvements. Enable sensors to remain in completed buildings and provide features of a smart building. Smart IoT-sensor-equipped buildings attract tenants (allowing owners to remain competitive), differentiate owners from other developers and increase the productivity and engagement levels of a building’s occupants. This phase is by invitation only for successful applicants selected from Phase I. In addition to supplemental technical information, applicants will be required to submit a detailed project plan, business information (financial statements, business plan, five-year pro-forma, management/corporate details), and demonstrate the technology, if applicable. This phase is by invitation only, with successful applicants selected from Phase II. Applicants will be required to submit a finalized project plan detailing the development/demonstration of their technology with the industry partner. Headquartered in Edmonton, Alberta, PCL is a privately-held and employee-owned group of independent construction companies operating in Canada, the United States, Australia and the Caribbean within the civil infrastructure, heavy industrial and buildings markets. As a large general contractor, PCL simultaneously manages hundreds of projects, leading to significant energy consumption/ costs. PCL estimates that it spends $200-$300 million annually in energy consumption across its construction projects in North America.